A Dental implant is made up of two parts. 1. Dental implant is placed under the gum and provides the foundation for the tooth (crown) part of the implant. This part is buried under the gum and cannot be seen. 2. 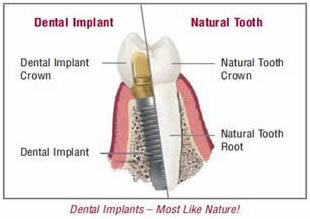 Implant Crown is the tooth part of the implant, which is visible as the replacement tooth. The Crown is either cemented or screwed on to the top of the dental implant.A lot of patients, and some dentists alike, believe that the two parts are completed at the same time. While this can be done in some cases, the majority of implants are completed in two stages. Normally the implant is placed as a separate procedure and allowed to heal or integrate into the bone. This normally takes 2 to 4 months. The artificial post and crown is then attached when healing is complete and the implant has securely fused with the underlying bone. The main reason that the implant and crown are not completed together is to allow the implant to quietly fuse with the bone over a period of eight weeks or so, much like the process that happens when a broken bone is healing. In the same way if you disturb a broken bone, it may not repair itself in the correct way. If the implant is disturbed during its healing process, by biting on it, it may not heal properly in the bone either. Having said that, in some cases, it has been shown that it is perfectly safe and sometimes helpful to restore the implant immediately i.e. placing the implant and crown all on the same day. Your dental surgeon or prosthodontist will advise you of whether you are a suitable candidate for this option. Some of the advantages are that you do not need to wear a denture or a temporary bridge and in certain circumstances, it will prevent the gum from shrinking as much as you would normally find with the delayed approach to placing an implant. Good candidates for immediate implants will have good quality bone, good quantity of bone and the area should be free from infection. There are numerous other dental factors that your dentist will advise you on, including your occlusion and / or your bite. Again, your dentist will advise you if you’re a suitable candidate. Patients who are not suitable candidates for an immediate implant are patients with infection associated with the area to be implanted, those with poor bone quality, quantity and those with complicated or heavy bites (occlusion). Your dentist will normally take either a CT scan or an x-ray with some bone evaluation techniques to help you make your decision.